When many think of Croatia, they think of the coast … and rightfully so. Even for a big country, Croatia’s coast would be large. For a relatively small country, which it is, the shoreline is positively massive. Running vertically along the western edge of the Balkan Peninsula, Adriatic is a breathtaking collection of some 1,200 islands and a total coastline (including both islands and mainland) which measures nearly 6,000 kilometers. Like it was made for sea kayaking. The winds are as integral a part of Croatian life as they are any place in the world. The weather can change fast here. The gales and breezes that blow across the water have trained sailors for centuries and they are necessary part of any Croatian adventurer’s training. We at Outdoor Croatia take the weather quite seriously. You could say it is our life. As such we make it our business to understand the both the pleasant winds that cool our summer afternoons and the ones that bring more forceful conditions and make us think of safety first. 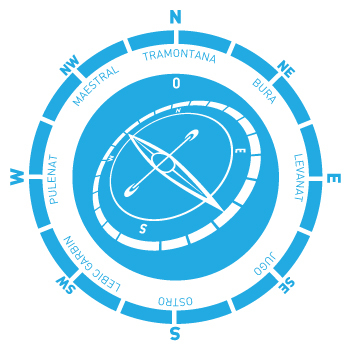 In Croatia all the winds have names, which are commonly used on weather reports. Below are the main winds you’ll hear a lot about during your active vacation in our country. This southeasterly wind — pronounced “you-go” — which rises in speed and strength — because of a lack of barrier islands to shield it — until it reaches its peak after a day or two. The Jugo wind usually brings along bad weather (clouds and rain) because of low pressure. Folk wisdom says: that the Jugo brings more than just changeable weather it brings mood swings. During the time of the old Dubrovnik Republic for instance. the Senate never made decisions while this wind was at gale strength. For paddlers, the Jugo means big, wide, fun waves. Blowing offshore from the northeast and down from the mountains, this wind is cooler and dryer and usually brings crystal clear sunny days. However, it is known for its unpredictability and hurricane strength. Because of this, and its big gusts, it is the most feared and respected among fisherman and is said the Bura likes to be “alone on the sea.” For kayakers, the Bura can bring choppy seas with irregular waves and can be very challenging. This summerly, northwest wind is the anchor of Dalmatian summer days and comes typically during the late morning through the early afternoon. It is a very steady and known for its regular behavior. So usually as the sun goes down the Maestral disperses instantly into a peaceful night. It is seen as a savior during very hot summer days and its cooling effect was even used as a building pattern for many Dalmatian cities: the streets would be open towards this wind so that they would have a sort of air conditioning. This moderate wind works as a refreshing tailwind for several of our routes. Among Croatia’s unheralded qualities is its specific geomorphology. More than fifty percent off the country is composed of high-quality limestone, a sedimentary rock that was once the bottom of the sea and is composed of sand, shale, and shells from millions of years of marine life. You will see it all around you while sea kayaking along Dalmatian coast. The result is a porous and easy stone to manipulate and climb. Croatia is blessed with a numerous high cliffs on the mainland and all along the islands. At the ground-level, Croatia’s karst — porous stone that provides bedrock for a beautiful, barren, and sometimes surreal landscape. For visitors and speleological experts, this means a never-ending supply of great photographic opportunities of mountain waterfalls and one of the world largest cave systems. From a cultural standpoint, limestone has been used by Croats for a millennia to build their cities. The most famous example is Dubrovnik, a UNESCO World Heritage site. The whole city and its fortifications were made of this, now centuries-old, polished limestone. This is a pity for them but this is good news for those in-the-know. When you are ready to take a break from the crowded streets of Dubrovnik’s Old City, catch a ferry to visit Dalmatia as it was meant to be seen. Taking our kayaks, of course :) Though there are 13 islands in the archipelago, only three are inhabited: Koločep, Lopud, and Šipan. During our tours, guests will paddle to each of these islands, meet locals, eat island-specific dishes, hike and cycle the interiors, and visit historical sites. Classic Kayaking Adventure and Discover Dalamtia weeklong tours explore Elaphiti Archipelago. Koločep is the closest of the inhabited islands to Dubrovnik. Once a shipbuilding center during the Ragusa Republic days, today it is a great place to explore caves, cliff jump, and paddle along its densely indented coast. Located just north of Koločep, Lopud has the most advanced tourism offer. But, thankfully, that still means it stays relatively uncrowded. Famous for its sandy beaches, it has a bevy of great little restaurants and cafe-bars. 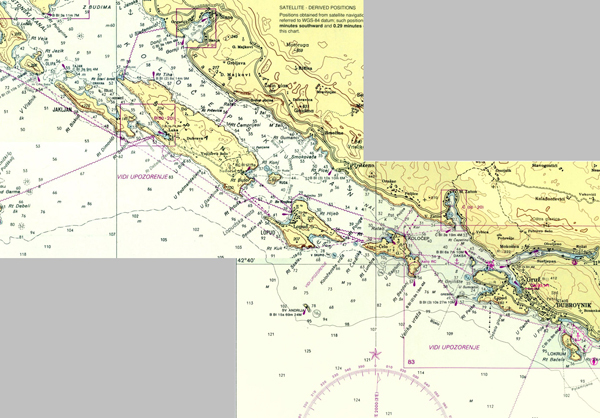 The largest in the Elaphiti Archipelago, Šipan was once a breadbasket for Ancient Dubrovnik. Today, visitors can bike from the coastal towns Suđurađ and Šipanska Luka and through olive groves and vineyards. Paddling around the island means stopping at wonderful caves, great swimming spots, and beautiful, private coves. We undertook a weeklong sea kayaking expedition back in early 2013, exploring our biggest southern islands, Brač and Hvar. 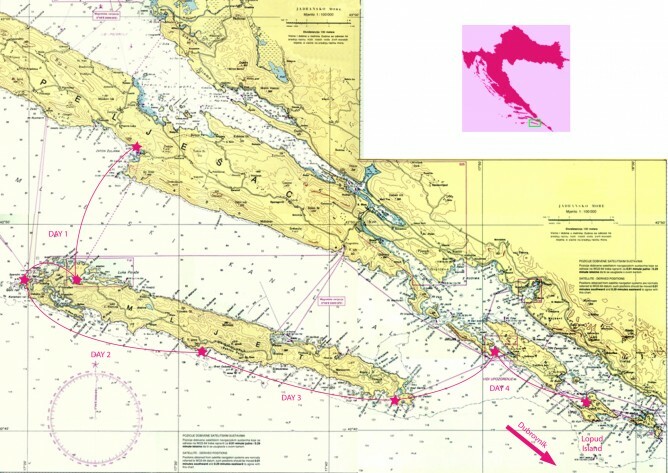 Starting from Trogir, which has been included in the UNESCO list of World Heritage Sites since 1997, we set a course to Šolta Island, which was going to be our biggest crossing of the trip: 12 km. We’ll had lunch in village of Maslinica and it took us some time to recover before continuing for Brač Island, where we spent the night in a small fishing village near town of Milna. The next day we start towards Bol and the famous “Golden Horn” beach, Zlatni Rat. On our way, paddled through old navy tunnels. In the afternoon we decided to stretch our legs a bit, and hiked to a beautiful old chapel carved in stone in a place called Pustinja Blaca. The crossing from Bol on Brač Island to Stari Grad on Hvar Island, that was planned for the next day was about 5km, and some additional 20km to get to Stari Grad. 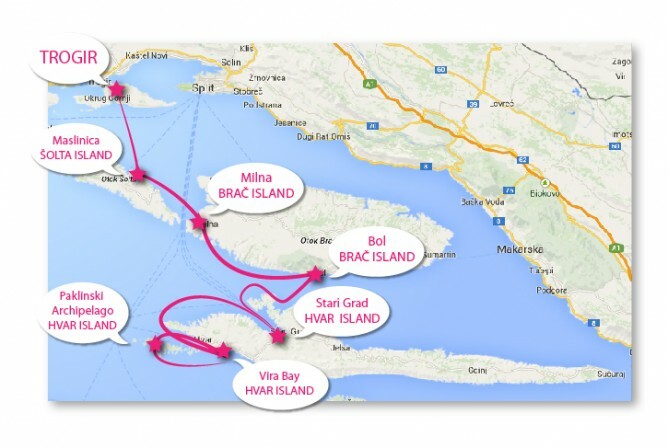 With two more paddling days left we made Vira Bay our objective for the next day, from where we could set out and explore beutiful Paklinski Archipelago, just on the western tip of Hvar island. For our Mljet expedition check out our Paddling Mljet Island blog post.